WATERFEST: Sign up to Volunteer! 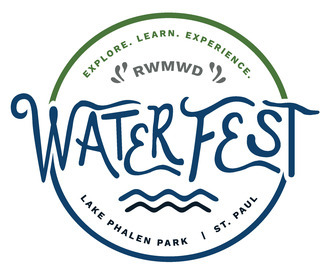 More about Waterfest 2019: This is our 20th celebration of WaterFest, this free, family festival celebrating our clean lakes provides an opportunity for outdoor hands-on learning about clean water, wildlife, and land and water conservation. Experience activities on and around the water with Voyageur canoe and sailboat rides; paddleboats, canoes and kayaks for checkout, fishing lessons, a fishing contest with prizes, water games, climbing walls, a jump castle, arts and crafts, face painting and lawn games, a Water Bar featuring water flights from our communities, the Passport Odyssey with wonderful prizes, performers, food for purchase and lots more! For more WaterFest information, including a detailed event schedule and map, sponsor list and photos go to http://www.rwmwd.org. Each volunteer will be given a T-shirt upon check-in, we ask that you please wear the shirt during the event. Make sure you let us know your T-shirt size! SET UP CREW: Assist with setting up tables in the Pavilion. Cover tables with tablecloths and tape down any electrical wires. SET UP CREW: Set up outside picnic tables, assist with setting up exhibits and distributing table information. Information Table: Assist with check in, distributing waivers and handing out prizes. Water Games: Assist exhibitors and exhibit spaces with water game needs. Greeter: Assist attendees with questions and greet people as they arrive. Fishing Lessons Assistant: Help attendees as they learn how to fish and cast. Recycling + Composting Assistant: Help attendees determine which bin to use when tossing their trash. WayFinder Navigation: Assist the public with directions on locating exhibitors. Animal / Water Character: Put on a costume and walk around the festival taking photos with our attendees! Clean Up Crew: Assist with moving tables back into place and helping exhibitors pack up.